This is a chronologic listing of Bathing scenes that appeared in anime, manga and other related media in the year 2007. There is a Bath scene with Charlotte E. Yeager and Francesca Lucchini. A Clawfoot Bathtub filled with blood is shown. Later a corpse is seen in a tub filled with blood in a Dream Sequence. "GoGo Sentai Boukenger episode 44"
Natsuki Mamiya takes a Bath. Otsuru is shown Skinny Dipping. Lelouch Lamperouge takes a Shower. Kalifa has a Bubble Bath scene. "Kenichi the Mightiest Disciple episode 14"
There is a Bath scene with Nana Komatsu and Takumi Ichinose. "Seikon no Qwaser chapter 7"
An image of Elizabeth Bathory having a Blood Bath is shown. There is a Bath scene with Nekane Springfield. Kozue Shirakaba has a Mixed Furo scene where she gets Intimate. Urado is seen taking a Blood Bath in a Clawfoot Bathtub. "Kyoshiro to Towa no Sora episode 5"
Jasmine takes a Bath in a Barrel Bathtub. "Jigoku Shoujo Futakomori episode 19"
Rangiku Matsumoto has a bath in a Unit Bathtub while staying the night at Orihime Inoue's house. While relaxing in the bath she talks to Orihime who is just outside the bathroom door. After hearing about how Orihime is depressed, Rankgiku gets out of the bathroom and leaves the bathroom still naked to hug Orihime. "Code Geass Picture Drama episode 2"
There is a Public Bath scene between Shirley Fenette, Kallen Kozuki, Milly Ashford and Nina Einstein. "Ichigo Mashimaro OVA episode 1"
"Powerpuff Girls Z episode 34"
There is a Bath scene with Blossom, Bubbles and Buttercup in a Hinoki Bathtub. "Ikkitousen: Dragon Destiny episode 1"
There is a Shower scene with Ryoumou Shimei and a Skinny Dipping scene in a Swimming Pool with Gentoku Ryuubi. "Yamato Nadeshiko Shichihenge episode 21"
Kallen Kozuki is shown Skinny Dipping at the beginning of the episode. There is a Bath scene with Shizuka Minamoto. "Venus Versus Virus episode 8"
There is a Furo scene with Yuno and Miyako. "Jigoku Shoujo Futakomori episode 22"
After "Toki" (Tokine Yukimura) freaks out over a bug, she trips and throws her stew at "Yoshi" (Yoshimori Sumimura). He is so concerned with catching her that he is unable to avoid it and it falls all over his head. Some of it also hits his little brother "Toshi" (Toshimori Sumimura) and his two schoolfriends, "Gatcho" (Gaku Mikawajima) and "Konta" (Taichi Komagome) so the three takes a combination Shower and Furo and Unit Bathtub session. Yoshimori is not shown bathing with them, but when the scene cuts to them cleaning up the mess, he is shirtless, with a towel around his neck, and there isn't any curry on his head, which implies that he took an Offscreen shower before them, which makes sense since he would be the dirtiest. "Yamato Nadeshiko Shichihenge episode 23"
There is a Public Bath scene with Miyako, Yuno, Sae and Hiro. "Jigoku Shoujo Futakomori episode 23"
"Ikkitousen: Dragon Destiny episode 4"
Kan'u Unchou gives herself a Sponge Bath. There is an Off Screen Shower scene and a Dream Sequence one. There is a Steam Bath scene with Gintoki Sakata and Toshiro Hijikata. "Umi no Misaki chapter 3"
Rinne Nagumo take a Shower. Eska Lonia and Miyaho Rokujou are Peeped on while bathing. "Irredeemable Ant Man chapter 7"
There is two Shower scenes one of them with Carol Danvers. "Ikkitousen: Dragon Destiny episode 6"
"Wellber no Monogatari: Sisters of Wellber episode 1"
"Kamichama Karin Chu chapter 1"
Karin Hanazono takes a Bath. "Hayate no Gotoku episode 2"
"Boku no Pico episode 2"
"Romeo x Juliet episode 3"
Juliet Fiamatta Asto Capulet has a bath in a Slipper Bathtub. "Kaze no Stigma episode 2"
"Seto no Hanayome episode 4"
"Mahou Shoujo Lyrical Nanoha StrikerS episode 4"
"Ichigo Mashimaro OVA episode 3"
"GeGeGe no Kitaro episode 5"
Neko Musume and Rokurokubi share a Bath in a Barrel Bathtub while wearing Towels. There is a Skinny Dipping scene with Clare. There is a Bath scene with Mugi Asai, Risaki Nishida and Nono Ichinose in a Hinoki Bathtub. Riza Wildman takes a Bath in a Clawfoot Bathtub. "Juken Sentai Gekiranger episode 12"
"Hayate no Gotoku episode 6"
Ayumu Nishizawa takes a Bath. "Tengen Toppa Gurren Lagann episode 6"
There is a Shower scene with Halle Lidner. There are a few Oil Drum Bath scenes. Konata Izumi, Tsukasa Hiiragi, Kagami Hiiragi, Miyuki Takara, Yui Narumi and Nanako Kuroi go to a Bath House to wash them selfs off of sea water they got from going to the beach. "El Cazador de la Bruja episode 7"
Nadie and Ellis have a Furo session. "Blue Dragon: Ral Ω Grad chapter 22"
Bira takes a Bubble Bath in a Slipper Bathtub. "Mahou Shoujo Lyrical Nanoha StrikerS episode 8"
"Tengen Toppa Gurren Lagann episode 9"
Yoko Littner has a shower scene. "The Skull Man episode 5"
There is a Skinny Dippig scene. There is an Onsen scene with Naruto Uzumaki, Kankuro and Temari. There is an shower scene. "Aika R-16: School Mission chapter 1"
Aika Sumeragi takes a Bath at a Public Bath. "Powerpuff Girls Z episode 50"
There is a Jacuzzi Bath scene with the Gain Green Gang, Fuzzy Lumpkin and Him. "Emma - A Victorian Romance: Second Act episode 10"
Nanette takes a Bath in a Slipper Bathtub and speaks to Emma who is putting on her dress. "Ikkitousen: Dragon Destiny OVA episode 1"
"Emma - A Victorian Romance: Second Act episode 11"
Emma gives Bubble Baths to Erich Mölders and Ilse Mölders in small neighboring Slipper Bathtubs with a Sponge while another maid washes Erich's pet squirrel Theo. "Nakadashi De Iinoyo ~Haha No Jukuniku~ chapter 1"
There is a Dream Sequence Bathing scene of Nami taking a Money Bath. "Kaze no Stigma episode 13"
There is a Bath scene at the end. "El Cazador de la Bruja episode 15"
There are two Hot Spring scenes. "Zero no Tsukaima: Futatsuki no Kishi Eye-Catch"
Throughout the first 6 episodes, the eye-catch is a zoomed in portion of an image of Louise Françoise Le Blanc de La Vallière taking a Bubble Bath. Episode 6 (which aired August 13th, 2007) is the final episode using this eye-catch which is when it is shown in full. There is a Bath scene with Kotonoha Katsura. "Zero no Tsukaima: Futatsuki no Kishi episode 2"
"Ikkitousen: Dragon Destiny OVA episode 2"
There is an illustration of Nami and Nico Robin taking a Bubble Bath. "Kaze no Stigma episode 16"
Amuro Ninagawa Showers herself with a hose. "Aika R-16: School Mission chapter 2"
"Seto no Hanayome episode 18"
After retreating from a battle against the members of Phantom Lord, Erza Scarlet is seen having a Shower back at Fairy Tail in the guilds shower room. In the shower she thinks to herself of how impossible the battle they are in because of the guild masters defeat and the guilds strongest mages absences and punches the wall in anger thinking that she should have been with the master in battle. While still in the shower, she and rest of the members of Fairy Tail feel the ground moving. When everybody is outside seeing that Phantom Lord is going to destroy Fairy Tail with a giant laser, Erza is seen along them wearing only in a Towel where she tells everybody to get back as the chapter ends. "Umi no Misaki chapter 13"
Sherwood von Phoenix takes a Bubble Bath in a Clawfoot Bathtub and later on there is a Furo scene. "Bludgeoning Angel Dokuro-chan 2 opening credits"
"Bludgeoning Angel Dokuro-chan 2 episode 1"
There is a Clothed Bathing scene. "Bludgeoning Angel Dokuro-chan 2 episode 2"
"Tengen Toppa Gurren Lagann episode 20"
Unnamed male bathers are seen in a Group Shower scene. There is an Onsen scene with Michiru Kita and Koyomi Yoimachi. The very first trailer for the game has the protagonist Rubi Malone taking a Bath in a Clawfoot Bathtub and resting her arms on the sides. After several flashbacks of her killing, she does a flip and the scene transitions back to her in the Bathtub, she is then seen outside of the tub naked and leaning on a lawn chair outside having a drink and answering a text message. There is a Shower scene where Nozomu Itoshiki is attacked in the manner of a Psycho parody. "Hayate no Gotoku episode 22"
Nagi Sanzenin has a bath in a Clawfoot Bathtub and has her Shampooed by a Servant. There are multiple Shower scenes, a Public Bath scene and a Skinny Dipping scene at the end. "Seto no Hanayome episode 21"
When Gen visits Yoshimori's family home, Yoshi's dad suggests he take a bath. When he refuses (wanting to leave) Yoshi teases gen about only wanting to take baths with Atora. Yoshi then burns his arm testing the temperature of the bath water. Gen Shishio is revealed as having taken an Off Screen Bathing session as Yoshimori questions if he washed the shampoo out of his hair in a later talk, indicating that he did give in to Yoshi's dad's request. Emma takes a Bath in a Clawfoot Bathtub after getting bruised up from falling off a bicycle. "Evangelion: 1.0 You Are (Not) Alone"
Misato Katsuragi has a bath scene. There is a Bath scene with Setsuna Kiyoura. There is an Furo scene. Dan Kuso and Drago has a Bath scene. There is a series of several Dream Sequence Bathing scenes. "Moribito: Guardian of the Spirit episode 26"
There are Bath scene in Bathing Gowns. "Dragonaut: The Resonance episode 1"
"Aika R-16: School Mission chapter 3"
"Hunter x Hunter chapter 261"
Hina takes a Bath in a Clawfoot Bathtub. "Ef: A Tale of Memories episode 2"
Nami takes a Bath in a Bathing Pool. "Da Capo II episode 3"
"Hidamari Sketch Specials episode 1"
Yuno has a Dream Sequence where she is Skinny Dipping. Later on, she takes a Bath in a Unit Bathtub. "Hidamari Sketch Specials episode 2"
"Kodomo no Jikan episode 2"
"Shakugan no Shana II episode 5"
"Avatar: The Last Airbender episode 47"
Katara has a Skinny Dipping scene. "Higurashi no Naku Koro ni Kai episode 18"
Rena Ryuugu has a bath scene. "KimiKiss: Pure Rouge episode 1"
Lucy Heartfilia is shown soaking in her bathtub at her house while she is thinking about Natsu's request to meet her at night alone. As she interrupts this as him attempting to ask her out, she decides that she will turn him down gently. Jessica Drew takes a Shower and gets threatened by James Howlett. When Lucy Heartfilia, Natsu Dragneel and Happy are helping an old woman named Tomekko get customers for her store, they try her soup and tell her its good and asks what is made out of and it then switches over to her taking a Bath in her rickety Barrel Bathtub with a Rubber Duck saying that its made out of her used bathwater causing them all of them to throw up. "Kodomo no Jikan episode 6"
"Ikkitousen: Dragon Destiny OVA episode 6"
"Kodomo no Jikan episode 7"
"Valerian & Laureline episode 12"
Laureline takes a Bubble Bath in a Clawfoot Bathtub. Valerian falls into the tub clothed. "Ef: A Tale of Memories episode 8"
"Maker Hikoushiki Hatsune Mix chapter 1"
There is a Furo scene with Hatsune Miku and Meiko. "Da Capo II episode 9"
"Moyasimon: Tales of Agriculture episode 8"
"GeGeGe no Kitaro episode 35"
"Kodomo no Jikan episode 9"
"KimiKiss: Pure Rouge episode 10"
There is a Rose Bath in a Bathing Pool. "Dragonaut: The Resonance episode 11"
"Shakugan no Shana II episode 11"
"KimiKiss: Pure Rouge episode 11"
The first level of the game depicts multiple Hot Springs which yeti are bathing in. There is one to the right when the level begins, and the next one encountered causes Sayuki to be swarmed by snowmen when she touches it. There is a Clothed Furo scene. Erza Scarlet and Lucy Heartfilia are shown having a bath in a Hot Spring at an inn they were staying at in the Spa Town Hosenka after finishing on of the missions they went on for the guild. During the bath, a narrative of Lucy shows describing that they were staying at this inn after finishing the assignment quickly. Leaves are shown falling into the hot spring while Lucy who is looking out from one of the Hot Springs edges and asks to herself what the deal is with Loke while Erza is seen in the background splashing water at a dragon fly. "Mahou Sensei Negima! chapter 166"
Sasuke Uchiha meets Suigetsu Hozuki. In a flashback of Gray Fullbuster and Lyon Vastia's childhood training under Ur, one of the panels during a montage of their training and home life together shows both of them sharing a Bath together in a small Hinoki Bathtub in Ur's house with Gray Arm Resting. "Mahou Sensei Negima! chapter 170"
There is a Hot Spring scene with Yue Ayase. "Mahou Sensei Negima! chapter 171"
There is a Hot Spring scene with Asuna Kagurazaka. Yuki Cross takes a Bath in a Clawfoot Slipper Bathtub and starts seeing Blood in the bath and is comforted by Zero. "Mahou Sensei Negima! chapter 179"
"Mahou Sensei Negima! 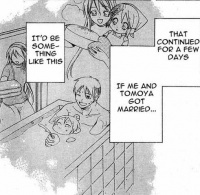 chapter 180"
"Clannad: Tomoyo After ~Dear Shining Memories~ chapter 3"
"Mahou Sensei Negima! chapter 189"
Chachamaru Karakuri goes Skinny Dipping. This page was last modified on 25 November 2018, at 20:52.